Wing span: 1 3/4 - 2 1/2 inches (4.4 - 6.3 cm). 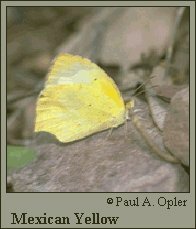 Identification: Upper surface is creamy white with indented black borders which outline a "dog's head" on forewings; more pronounced in male. Hindwing with projecting tail-like points. Flight: Midsummer to fall as vagrant, all year in tropics. Caterpillar hosts: Acacia and Diphysa in the pea family (Fabaceae). Adult food: Nectar from a wide variety of flowers. Habitat: Open, dry areas: flats, hillsides, deserts, prairies. Found in moister areas in Mexico and Central America. Range: Resident from Central America north to South Texas and the Southwest; common vagrant in Great Plains and Southwest deserts; rare migrant to Mississippi, Arkansas, Illinois, and Michigan.